St. Gregory of Nyssa is located in Portero Hill, San Francisco, in the Diocese of California. It draws parishioners from around the Bay Area. The congregation was started in 1978, and in 1995 it moved into its present building. The church building, designed by the architect John Goldman in consultation with the founding co-rectors, won an award from the American Institute of Architects and has been featured in several books on church architecture. It borrows exterior elements from Siberian Orthodox churches, Japanese Shinto shrines, and Craftsman architecture. The floor plan is based on Louis Bouyer's work, inspired by the worship of fourth- and fifth-century West Syrian churches, with two worship spaces. Worshippers enter directly into an octagonal room surrounding the D-shape altar-table, turning right to move into a rectangular room with chairs facing across a long aisle, with the presider's chair at far end and the ambo at the near end. The baptismal font is in a garden on the far side of the octagonal room from the main entrance. Inside, a principal feature is the iconography of dancing saints in the rotunda over the altar. Painted by Mark Dukes, the company of saints includes traditional figures like Francis and Aelred alongside Malcolm X and Martha Graham. The interior of the church, filled with light from clerestory windows in the rotunda, is furnished eclectically: a Russian menorah stands near the ambo where the scripture is read, the presider's chair is a howdah, an elephant saddle; liturgical leaders wear West African textiles; a Shinto shrine is the tabernacle; and Ethiopian crosses, Japanese temple bells, and African drums ornament the worship. St. Gregory's is located in the Portero Hill neighborhood of San Francisco, across the street from a brewery and down the street from a high school. Residential and commercial buildings crowd together. The area population (within a three-mile radius) is diverse: 46% white, 26% Asian, 17% Latino, and 8% African-American. The average age is 40.2 years, older than the state average of 37.7. Per capita income is $57,411, well above the national average of $33,205. Not everyone has shared equally in the area's prosperity: the Portero Terrace public housing development a mile away is a tangible reminder of the income disparities in the area, and data shows that African-American household income is less than a third of white household income. Housing cost is an increasing challenge for middle-class San Franciscans, as well. Educational attainment exceeds the state average, with just over 54% of adults in the area having completed a bachelor's degree or higher, compared to just over 30% for the state. The parish hosts The Food Pantry, which distributes food every Friday to about 400 families. The Food Pantry gives away tons of food each week (4-5 tons on the day of the visit), both shelf-stable and perishable, treating its guests with dignity and respect. It does so with volunteer labor and without government or foundation funding. For a gallery of images from the Pantry, click here. Set-up for the Pantry begins after morning prayer. Plastic tarps are set out, and large pallets of food are moved into the church under the rotunda. Volunteers sort the food, arrange it in stations circling the altar, and determine how much to allot to each guest. It is symbolically important that the groceries at the Pantry are distributed around the same altar where the eucharist is celebrated on Sunday: this parish integrates liturgy and action. Once everything is ready, the volunteers pause for lunch, cooked from the ingredients they will be distributing. They eat together at long tables in the space where the word is proclaimed on Sundays. On the Friday of the site visit, the Pantry's anniversary was celebrated with a eucharist before the lunch: the volunteers prayed for the pantry and all whom they served, sharing communion surrounded by cantaloups and canned goods. The distribution of food is orderly. An system of color-coded tickets, staged arrival times, and the careful work of volunteers keeps the flow of people through the church even and the atmosphere remarkably calm. Volunteers stand at each station to ensure equitable distribution of each item, and other volunteers load bags for those who can't make the walk around the stations. In addition to the Food Pantry, the parish hosts a number of groups and activities. Children and youth are included in every way imaginable: there is a strong Godly Play program and educational offerings for all ages, timed to allow full participation in the liturgy. Play-dough, books, and coloring sheets and crayons are available during the liturgy for smaller children, while older children are encouraged to take leadership roles in the liturgy. Younger Christians are taken seriously as Christians here, in a way that they too often are not in other places. St. Gregory of Nyssa offers three services each Sunday morning, plus a monthly evening eucharist and daily morning prayer. The parish places a premium on welcoming the stranger, and this is manifested in several ways: greeters who quickly connect the visitor with a member of the congregation to help serve as guide; careful and clear directions during the course of the service (discussed at greater length below); and an underlying theology, framed in an opening prayer that likens the welcoming of the stranger to the welcome that God extends to each of us. The eucharistic liturgy is based on the structures in the Book of Common Prayer, but the parish (with encouragement of the current bishop and his predecessor) has developed its own scripts. These draw from Eastern liturgical texts and structures, as well as local compositions. The scripts are not put in the hands of each worshipper, so that they are free to engage with the liturgical action around them rather than gluing their eyes to the liturgical text. Leadership in the liturgy is shared widely. Ordained presbyters (priests) preside at the eucharist, while lay worship leaders assist by giving directions, prompting readers, setting the table at the eucharist, and distributing communion, as well as leading morning prayer. The parish music director functions as cantor, with a large role in the liturgy. A multitude of other lay people share in responsibilities: reading lessons (including the gospel), singing in the choir, tending the incense, lighting candles, and the set-up and clean-up before and after services. Children have prominent roles, alongside the adults. The 8:30 eucharist begins directly after the canticle that ends "Daybreak," and much of the congregation has drifted into the building and taken seats during the contemplative office. The cantor (the parish's director of music) teaches the congregation a sung Alleluia refrain and sings the entrance psalm. The tower bell is rung, and the presider enters, carrying an Ethiopian processional cross, accompanied by the rector (who will preach) and a vested assistant carrying a candle and the gospel book. (Today, the presider at this service is a non-stipendiary priest affiliated with the parish.) The presider says an opening acclamation, "Christ is risen!" and the people respond, "He is risen indeed!" The cantor gives brief instructions about where to find the music for the day. (There is no printed order of service, but there is a music book with printed inserts for the day.) The people sing the Trisagion, and lay assistants light the candles at the ambo. The presider prays the opening prayer. St. Gregory's has expanded Advent to seven weeks, encompassing the revised common lectionary readings that reflect eschatological themes, and during Advent, an O Antiphon is used as the opening prayer (in other seasons, a prayer attributed to Erasmus is used). The presider says another acclamation, "Blessed by God, Father, Son, and Holy Spirit," the people reply, "And blessed by God's Kingdom, now and forever," and the cantor leads the people in the incense hymn (today, the Gloria in excelsis). A lay person reads the only reading from scripture, today from the gospel. After the gospel reading, the cantor rings the temple bells, and two minutes of silence is kept, after which he rings the hand bells. The rector preaches, seated on the elephant saddle. The sermon is about ten minutes long. The cantor rings the temple bells again, and two minutes of silence are kept, after which the hand bells are rung to close the silence. The preacher invites everyone present to share from their experience and to listen to one another. Several members share their reflections on the gospel reading; the sharing lasts about five minutes. A lay assistant introduces the singing of the Lord's Prayer; after the line, "and deliver us from evil," the presider chants the collect of the day. The cantor leads the singing of the doxological conclusion, "for the kingdom, the power, and the glory..." The lay assistant (briefly and efficiently) instructs the congregation in the Tripudium dance step (three steps forward, one step back), and the cantor leads the singing of "Judge eternal, robed in splendor," as the congregation dances into the rotunda. Once the hymn is finished and the congregation has circled the altar, they exchange the Peace. The presider sings the eucharistic prayer, punctuated three times by the people's sung acclamation ("we praise you, we bless you, we give thanks to you, and we pray to you, Lord our God"). While the presider sings the prayer, the people maintain a monotone hum (like the drone of a bagpipe) during the prayer. The prayer concludes with the Sanctus, sung by the congregation. The cantor then leads them in singing "Servant of God," an adaptation of the traditional Agnus Dei text, while the presider and assistant break the bread and prepare the chalices. The presider sings the ancient invitation to communion, "Holy things for holy people," after which the lay assistant invites the people to communion by saying, "Jesus welcomes everyone to his table, and so we give everyone, without exception, the bread and wine, which are Christ's body and blood." She then communicates the presider, who in turn communicates the cantor and lay assistant. The cantor then gives practical directions to the congregation and starts them singing "Taste and see that the Lord is good" during the distribution. The presider and lay assistant distribute bread, while the congregation passes the chalices from person to person. After all have received the bread and wine, the lay assistant returns the implements to the altar, and the presider prays a postcommunion prayer. The lay assistant then invites people to bring their offerings of money for the work of the church to the altar, and the cantor leads the congregation in a sung alleluia. The lay assistant invites anyone with a birthday or anniversary to come forward for a blessing. Those with special occasions come forward, and the congregation lays hands on them and sings "Bless them, Jesus" to the tune, Thuma mina, while the presider blesses them with the Ethiopian processional cross. Finally, the cantor gives brief instructions, and the congregation sings and dances the carol, "Thy kingdom come on bended knee." The lay assistant dismisses the congregation, and coffee and snacks are brought out, and placed on the altar for "coffee hour." The people disperse after refreshments, heading to the centering prayer group, the rector's forum, various Christian formation classes, or home. People gather in the rotunda. A bell is rung, and the crowds quiets. The presider sings a prayer asking God's help in welcoming the stranger. The cantor leads the choir in a prelude, based on one of the O Antiphons. The presider shouts "Christ is risen!," to which the the people reply, "He is risen indeed!" The cantor give some brief directions, and the congregation sings the Trisagion. The cantor sings a psalm as the clergy and people move into the seating area, singing an "Alleluia" refrain. The presider goes to the chair (the elephant saddle) and the vested leaders find their places near him. The presider sings an acclamation, "Blessed by God, Father, Son and Holy Spirit," and makes the sign of the cross over the people with the gospel book. The congregation sings the Third Song of Isaiah ("Arise, shine, for your light has come") as two vested lay assistants carry the gospel book and a candle to the ambo, adding incense to the bowl there on their arrival. The presider sings a prayer based on one of the O Antiphons ("O Adonai...") while the people drone a note. The people sing "Sh'ma, Yisrael..." and a lay persons reads the first lesson, from the prophet Isaiah. The cantor rings the temple bells and holds two minutes of silence, closing it by ringing the handbells. He then leads the assembly in singing the hymn, "Comfort ye, comfort ye my people," the first stanza in unison and the subsequent ones in four-part harmony. A lay person then reads the gospel. After the reading, one of the lay assistants carries the gospel book to the presider, who holds it. The cantor rings the temple bells and holds two minutes of silence, closing it by ringing the handbells. The presider preaches from the elephant saddle, for about fourteen minutes. The cantor rings the temple bells again, and one minute of silence is kept. The preacher invites everyone present to share from their experience and to listen to one another. Several members share their reflections on the gospel reading; the sharing lasts about five minutes. The people sing an Alleluia, as the gospel books is brought around by the presider for the people to kiss or touch. Once the book has been carried through the congregation, it is taken to the shrine and placed there. The congregation sings the Lord's Prayer, but stops after, "but deliver us from evil." A lay leader leads the people in a litany of intercessions, to which they reply "Lord, have mercy." The people add their own petitions in the course of the prayers. The presider adds the collect of the day as a concluding collect, and the congregation sings the concluding doxology of the Lord's Prayer ("For the kingdom, the power, and the glory..."). One of the vested lay leaders the congregation the basic dance steps of the Tripudium, and the congregation dances into the rotunda, circling the altar. Upon arrival, the congregation exchanges the Peace. The presider sings the eucharistic prayer, with the people singing the responses. The text is based on imagery from the Gospel of John. It culminates in the singing of the Sanctus. The presider and vested assistants break the bread and fill the cups as the congregation sings "Servant of God," an adaptation of the Agnus dei. The presider chants the invitation, "Holy things for holy people." A lay assistant invites people to receive communion, "without exception." The cantor gives brief directions on how to receive, and the presider and vested lay assistants distribute bread, while the people pass the cup among themselves. The choir sings an anthem during the distribution. After the anthem, the choir receives communion while the congregation sings a simple chant, "Taste and see that the Lord is good." At the end of the distribution, the presider says the postcommunion prayer, based on the Baruch prophecy. A lay assistant then invites people to bring their offerings of money for the work of the church to the altar, and the cantor leads the choir in an anthem (accompanied by a trombonist, the first non-percussion instrument used today). A lay assistant invites anyone with a birthday or anniversary to come forward for a blessing. The presider blesses them with the Ethiopian processional cross while the congregation sings, "God grant them many years." A layperson makes necessary announcements, and then the cantor teaches everyone the steps to the carol. The congregation dances the carol, "Thy kingdom come on bended knee." A lay assistant then gives the dismissal, and volunteers place coffee and snacks on the altar for "coffee hour." Members of the congregation finish the preparations for the potluck supper in the rotunda, and the presider briefly welcomes everyone. A layperson starts the singing of the Trisagion, after which another lay leader invites everyone to move into the seating area while singing, "In the darkness, a light is shining/ Maranatha, come Lord Jesus" multiple times, to cover the movement. Everyone gathers around the bema, the raised central platform, and the presider sings an opening prayer, during which the people drone a monotone chant, joining in the concluding Amen. All sing scriptural verses about light, as the children present light the lamps and candles. A lay leader explains (briefly, in child-friendly language) the purpose of contemplative silence, and rings the temple bells to keep 30 seconds of silence. She closes the silence with the handbells. Then a child reads the gospel. The lay leader rings the temple bells to mark another 30 seconds of silence. A storyteller then uses icons to tell a story about the prophets as forerunners of the Messiah, in the style of a Godly Play lesson. The story is punctuated at points by a cantor singing the O Antiphons (one after each icon is introduced), and the children present pass the icons around. The story functions to launch the Advent season, and the storyteller uses "I wonder" questions to open up the story and invite participation and reflection by the children present. After the storytelling, a lay leader invites the congregation to move into the rotunda, singing the same refrain that they had used for their entry into the seating area. The congregation sings the Lord's Prayer, and the leader then invites the people's intercessions. A few share them out loud. The presider adds a concluding collect. The congregation sings "Dona nobis pacem," as they exchange the Peace and the table is set. The congregation is invited to stand close to the table, and to make sure that children can see. The presider sings the eucharistic prayer, with a lay leader singing the preface. The congregation drones a monotone chant under the entire prayer. The eucharistic prayer is a brief, local composition, using imagery of light and darkness in keeping with the season and the perfect length for children's sometimes shorter attention spans. The prayer concludes in the Sanctus, sung to the tune, "Holy Manna." A lay leader welcomes all to communion and gives brief instructions. The presider and lay leader distribute bread, while the congregants pass the chalice from person to person. During the communion, the congregation sings a Taizé chant, "Eat this Bread." Once all have received the bread and wine, the lay leader invites the people's offerings of money for the work of the church. As this happens, the congregation sings a simple song of thanksgiving. The presider then invites everyone to join in the potluck meal. After the meal, a final song and dismissal concludes the evening. The parish uses a variety of liturgical resources for its texts and music. Sources of texts include the ICEL Psalter (1995), the 1979 Book of Common Prayer, Enriching Our Worship vol. 1, and homegrown texts written by clergy and laity of St. Gregory's. Music is drawn from the Hymnal 1982 and two hymnals published by All Saints' Company, a spinoff of the parish: Music for Liturgy (2000) and Music by Heart (2008), as well as unpublished music composed by members of St. Gregory's. Planning is done by the rector and music director, with input from other members of the staff. Assessment and adjustment happens weekly: the previous Sunday's liturgies are evaluated at a weekly staff meeting, with any necessary adjustments then made to the following Sunday's liturgies. The music director plans music on a 3- to 4-week basis. The liturgies for Holy Week and Easter are planned each January, and planning for seasonal shifts (for example, Advent or Lent) and major holy days (such as All Saints' Day) happens on a similar, advance basis throughout the year. The Ordo, or basic structure, of the liturgy is rarely changed, and only with careful, advance planning and lots of consultation and assessment with the worshipping community. The use of music and dance is especially noteworthy. The choir is not vested, and its members are scattered amongst the congregation, all the better to support and lead congregational singing. The choir members gather in one group only for a prelude and two anthems (at the communion and at the collection). This has the happy effect of helping the assembly sing without instrumental accompaniment, and often to do so in gorgeous, four-part harmony. The experience for a visitor of joining in unaccompanied song and in dance is a powerful one of individuals being knit together into a body—the very thing that theologically we affirm takes place in church, but that one too rarely experiences. The parish has been blessed by three rectors (two founding co-rectors and the current rector) who have been scholar-practitioners, thinking deeply and reflectively about the liturgy. The current rector's D.Min. thesis discussed the culture of the parish, examining the transformation that can be wrought by aesthetic experience, social action, and friendship, and he has recently published a book based on that research. The transformation of the 8:30 a.m. eucharist is an example of the leadership's ability to adapt the liturgy. Originally the "quiet and contemplative" service, it became the prime time for families with young children, both because of its more modest length and a start time that fell before a toddler's typical morning nap. This made the service "very, very lively," as the rector put it. Recast now as the "simple" service, the rector made several adaptations: the time from the opening of the liturgy to the start of the sermon is no more than ten minutes, preaching is much more narrative and is kept to about seven minutes, and children are free to move about during the liturgy. Older children (7, 8, and 9 year-olds) serve as vested leaders. Attendance at this liturgy has tripled in five years, with a third of the congregation younger than 9 years old. The "quiet and contemplative" mode has been shifted to a new service, at 8:00, comprised of psalm chant and silence. The parish leadership saw an evolution in the congregation at a particular service, thought about how to accommodate that change, and crafted a liturgy that met those needs, while creating a substitute service for those who might have been deprived by the changes. Some of the things that work at St. Gregory's do not work in other parishes, perhaps because of the greater intentionality and meticulous care exercised at St. Gregory's. Ordinarily, oral "stage directions" are not helpful in the liturgy; they tend to become rambling and verbose. Calling out page numbers is especially unfortunate, as the practice tends to rip one out of the liturgical act, making one conscious that one is simply working through a script. Few places with effective worship call out stage directions or page numbers. But this general rule breaks down at St. Gregory's, where lay assistants and the cantor call out directions during the liturgy, and yet the congregation does not pull out of the unselfconscious state that marks good ritual engagement. There seem to be a couple of secrets to this: first, there is no prayer book or printed order of service, so the congregation is rarely looking in a book instead of engaging with the liturgical action going on around them; second, all of the directions, whether concerning movement or where to find music, have been tightly scripted and honed over the years, so that only the necessary information is given, and in as inviting a manner as possible. The stage directions are important to the parish's culture of hospitality, because the liturgy is designed to be as accessible as possible to visitors. St. Gregory's is widely known for its liturgy. 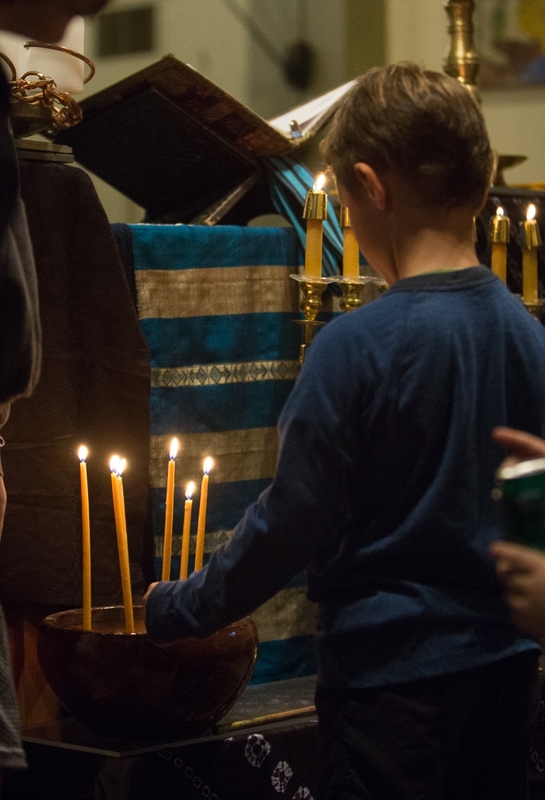 The congregation has been profiled in various media, and the founding co-rectors' All Saints' Company has produced liturgy workshops in San Francisco and around the country to share St. Gregory's approach to liturgical renewal. This can be a double-edged sword: media profiles can be superficial and to fixate on congregational dance and the eclectic mix of Ethiopian parasols, Japanese temple bells, and the elephant saddle, while some workshop attendees in the past took home the parasols but not the principles. But what the visitor finds is a congregation that is grounded in love of God and neighbor, and a liturgy that is done with authenticity and vigor. The accoutrements of the liturgy, far from being a focal point, fade into the background of the liturgical action, in which the whole assembly seems fully engaged. The explosion of color and song and incense overwhelms the senses and allows the worshipper to engage in the deeper stuff behind those stimuli. Congregational dance (while singing, at that) erodes the stiff reserve that much of Anglican culture has cultivated, and moving and singing in synchronization with others forges a sense of commonality. The superficial things that media profiles highlight are simply means to an end, the end being to lose one's self in the liturgy and be caught up in a transformative experience of the love of God. The integration of liturgy, hospitality to the stranger, Christian formation, the arts, and social action in this parish is a compelling model for other congregations to emulate. So is the way in which the parish engages everyone present in the liturgy. There is a sense in which the liturgy at St. Gregory's is the work of amateurs, which is not to say that the liturgy is "amateurish," but rather that it is done by people motivated chiefly by their sheer love for the activity. The professional clergy still preside and lead, but they have shared out as much of their work as is responsible, and many of the speaking parts are given over to lay members of the congregation, from the cantor to the vested lay leaders assisting at the altar to the lay members reading the gospel.